Hi, I had a Drop.2 scrubber which was working ok but i have old live rock laden with phos which the drop.2 couldnt handle. I bought a HOG2. Here are some pictures of my juwel Rio 125l aquarium with said HOG2 scrubber and results. As you can see from the pix, there is still a bit of algae on the rocks but it is definately getting the chase by the scrubber. the HOG2 is only 33 days old today and has almost filled the inside with light green algae spirals. Ive now bought a slightly larger Juwel Vision 180l aquarium and i want to use LED lighting. 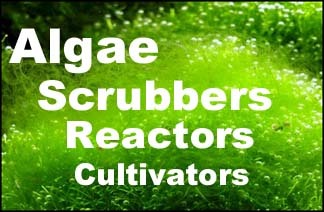 My goal will be to have the scrubber as the sole filtration along with the live rock. There has not been a skimmer on the tank and never will be, the scrubber bubble noise is loud enough for me, i used a skimmer years ago and the noise was shocking. i will post updates and expect the HOG2 to continue to work miracles, thanx santa monica for such a fantastic product!! Glad to see phosphate coming out of the rocks, and tests looking good. What probably is happening is that nutrients are a bit low for the softies. Or at least, the nutrients dropped too quick for them to adjust. This often happens when tank are very low nutrient levels. A solution is usually just to feed more, or, to add more fish. Its a good problem for me but not my poor deceased corals :-(. Forgot to add, I only use natural seawater and last water change was a month ago. ive tried to stay under the feeding rule for the scrubber size but not always done so. Nobody can be more pessimistic about the results you can get with a scrubber than I was but im now a convert to them. Do I get sales commission? Lol. Seriously tho. Its fantastic. Hi SM, here is an update on my HOG2 scrubber. There seems to be a problem and i have no idea what it is because my algae and red cyano problem is looking a lot better, tests are all fine, ammonia 0, nitrite 0, nitrate 0, phos 0, calc 440, carb h 10, PH 8.2. The scrubber was growing great fresh green algae but it has turned mushy and all around it has turned orange. some of my corals are good but some have closed up, one of my clowns flicks itself on the sand. Any ideas of whats happening? The live rock is a bit dirty looking because i moved everything from my juwel rio 125 to the bigger juwel vision 180 and the sand made the water cloudy. When did you do the move? I changed from the rio to the vision aquarium on tues 30th September. Yes sorry. One of the pics I posted at the start of this thread show the start of the orange. That was prior to changing over aquariums. I cleaned the hog2 but it still looks orange. If it looks like it will fill up orange again... what do you recommend I could sterilise it with to start all over. With the tests all showing consistent low readings. It has me foxed. Anybody else had the same problem? The xenia has red patches on it too. That a bad sign? Moving rocks, even in the same tank, is a bad thing. Moving rocks from one tank, into the air, to another tank, is the worse thing you can ever do. It kills the periphyton on the rocks, especially the sponges, and reduces the filtering that the periphyton provided, thus increasing the nutrients in the water. And now that the periphyton is dead, it will start decaying even more in the next several weeks. So it will get worse before getting better. So, never move rocks unless you absolutely must. After a move of the rock, even under water in the same tank, it takes about one year for the periphyton to re-establish itself, and that's if you don't change powerheads or other flow. The orange does not mean anything; it's just a particular type of growth that you can see because of the white background in the scrubber. Also there is no correlation to your fish or corals; they are just responding to your move. However the orange is slippery and needs to be brushed out with a toothbrush in your sink. Also with the higher nutrients now, you need the most scrubber light possible: 22 hours.